There are so many body oils out there these days, but unfortunately they’re all not created equal. Here’s the deal: Your body absorbs over 60% of whatever we put on it. Yeah, crazy huh?! So basically whatever you’re putting on your skin, your body is literally drinking up. It then enters your blood stream. Many times there are chemicals like dimethicone, mineral oil, petroleum, parabens, synthetic fragrance, dyes and some forms of propylene glycol. Yikes, is the word that comes to my mind! These pose a serious threat for your body. Things like endocrine disruptors, irritants, and carcinogens…just to name a few. This isn’t your small face your lathering this on, but your whole body. That’s a lot of skin to be soaking up every last chemical. And since people apply some form of moisturizer nearly everyday, this is definitely cause for concern. I’m going to cover my favorite body oils in this post. But I also have some fave body lotions, I’ll cover in another post. I love body oils for a couple reasons. One, they usually only have a handful of ingredients. So it’s super easy to tell right off the bat if it’s clean or not. Secondly, I feel body oils tend to hold their scent a little longer. Obviously, I’m not talking synthetic fragrance here, but natural/essential oils. I’ve used a ton over the years, and narrowed it down to a few favorites. I even have a DIY body oil for you to try out. This was one of the first natural body oils I tried and I fell in love with it. The smell is what sold me. With notes of frankincense, citrus and neroli, this will have you coming back for more. It has a blend of four different oils, and soaks right into the skin. This is a little heavier than some of the other oils. Oh and did I mention it comes in a glass container? Yeah, I love that! It has a pump for dispensing the oil. It’s a little pricier at $29.99 but I get mine from Pharmaca.com and I always get at least a 25% discount. A little goes a long way though, so you will have it for a while. 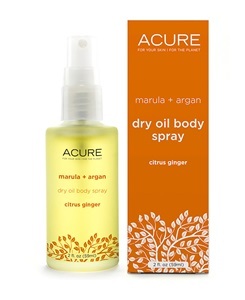 This spray is a great light oil. I love that it comes in a spray bottle. Makes it super easy to apply. I love the Citrus Ginger scent. But they also have it in Coconut and Rose. This is more of an economical option at only $12.99. Again, I always get a discount on this one too at Pharmaca.com. It comes in a glass bottle as well…yay! I really haven’t found a product from Acure I disliked. I love that you can find them almost anywhere too, even Whole Foods carries them. This is one of my most recent faves that I can’t stop using. For starters the smell is insanely addicting! It smells like the tropics…I literally get taken away to Hawaii every time I use it. Hey, I’m not complaining! 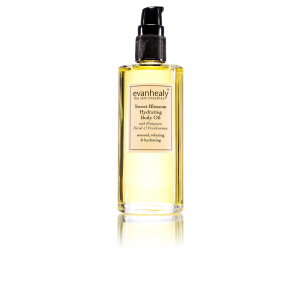 It isn’t a super heavy body oil, a nice light oil that does it job of moisturizing. It also comes in a glass bottle…oh yeah, I’m three for three. And wait for it…it sprays as well. I know pretty amazing. I just love the spray feature, it makes it so easy to just spray all over and rub in. And when you travel it has this really nifty lock/unlock on the spray nozzle, so no leaking. Um, can you say hallelujah?! Trust me you need this in your life. It’s the most expensive at $38.99 but honestly worth every penny. Oh and it’s at pharmaca.com as well…of course, so you can usually get this for 20% off. So if you’re wanting to get in touch with your Martha Stewart skills I have the perfect diy moisturizer for you. Just snag your favorite oil. You can find these almost anywhere. Whole Foods carries them, as well as a lot of natural stores or even some supplement stores. I get mine from Amazon. 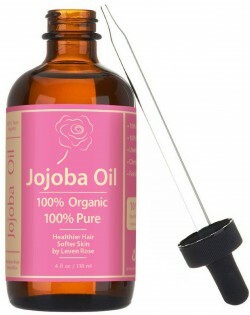 I like using Jojoba personally. It is the closest oil to what your skin actually reproduces. I will just add a few drops of my favorite essential oil to the oil and bam…you’ve got your own diy body oil. Easy peasy! You can mix oils too if you like. What are your favorite body oils?? Leave me a comment! great picks! I love the OLO Vitamin C Body Oil – have you tried it? 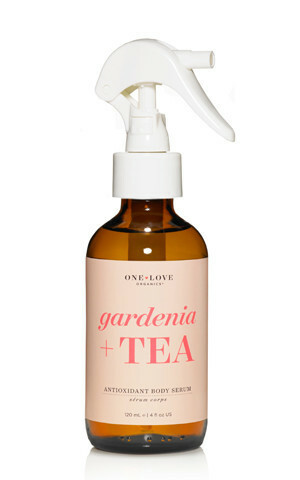 I need to try the gardenia one! I also love the body oils from African Botanics, Organic Bath Co., and more recently, I’m loving Glow Body Serum from Plantfolk and the Kypris Body Serum which is AMAZING. You must try them!